Introduction: The incidence rate of true non-traumatic radial artery aneurysms (RAAs) is low, and very few cases have been described. The majority are traumatic in origin and are iatrogenic pseudo-aneurysms following arterial cannulation. However, other rare causes such as vascular tumors, connective tissue diseases, and occupational injury have also been reported. Only eight cases were reported as idiopathic true RAA. Herein, I describe a case of true idiopathic distal RAA, which was managed by surgical repair. 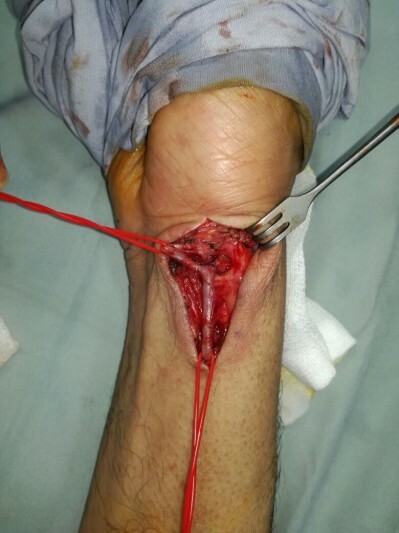 Case presentation: A 61-year-old-man with no significant medical history presented to vascular clinic with complaint of a nontraumatic mass on the volar aspect and radial side of his right wrist for 6 years. Duplex ultrasound and computed tomography angiogram revealed distal RAA. It was managed by open surgical resection with primary end-to-end anastomosis. Histopathological studies revealed true aneurysm of the distal radial artery. Conclusion: True distal RAAs are an extremely rare entity. Unawareness of this condition might lead to inappropriate management with significant morbidity. Surgical management is generally indicated, but the best treatment remains controversial.